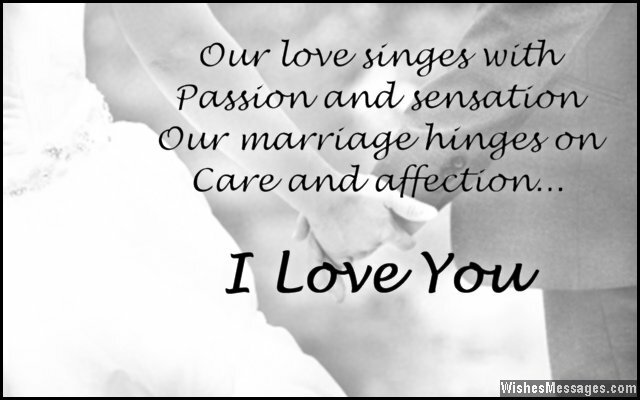 I Love You Messages for Husband: Unless you express your love for your husband, he will never know how you feel for him. Sweet little things like leaving I Love You notes in his shirt pocket, posting cute quotes on Facebook, sending I Miss You texts while he is at work and sharing funny pins on Pinterest go a long way in rekindling the romance in your marriage. Such romantic gestures can become the foundation of the intimacy in your relationship as husband and wife. If it is a special occasion like your wedding anniversary or his birthday, go one step forward and write a heartfelt message on a greeting card to profess your love for him with style and grandeur. 1) Every single day that I spend being your wife, I realize how lucky I am to live such an amazing life. I love you. 2) If my life was a ship, you would be the anchor that holds me in place and the sails which take me on a beautiful journey. I love you. 3) My life’s biggest security is not just in loving you, but in knowing that you will always be there to love me back no matter what. I love you baby. 4) It doesn’t matter who the boss of this house is, as long as we end the day with a romantic kiss. I love you. 5) If my life were a business, entering into an unconditional and irrevocable partnership with you has been the most profitable decision ever. I love you. 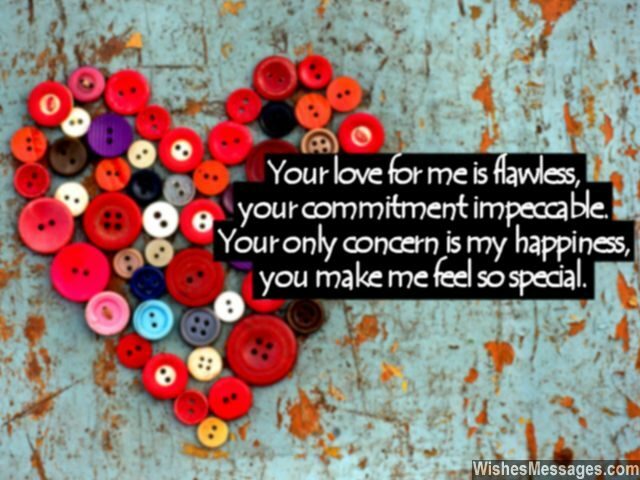 6) Your love for me is flawless, your commitment impeccable. Your only concern is my happiness, you make me feel so special. I love you. 7) Amidst the suffocation caused by life’s problems, your love comes as a breath of fresh air. I love you. 8) My life’s biggest achievement is that I get to be with an awesome man like you every day. I love you. 9) There should have been a cautionary warning below your name in our marriage certificate that reads – Beware of Hot Husband. I love you. 10) Hours, days, months, years and decades can go by, but I will never forget the moment when you held me in your arms, looked into my eyes and whispered I Love You in my ears – it still gives me the shivers. I love you. 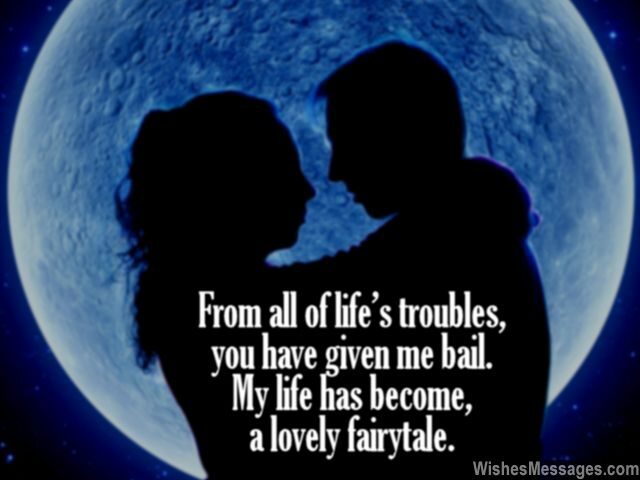 11) From all of life’s troubles, you have given me bail. My life has become, a lovely fairytale. I love you. 12) I could easily say that I love you to death, but I really want to live forever to love you eternally. 13) Much more than just attraction, lust and passion, our marriage embodies honesty, care and affection. Love you. 14) The best part of our marriage is that the look in your flirty eyes still makes me feel like the most beautiful girl alive. I love you. 15) Who cares if opposites attract or not? Even if we weren’t opposites, I would’ve still loved you a lot. 16) Every day of my life is perfect because it starts and ends with loving you. I love you. 17) I make our marriage organized, you make it outstanding. I make our married practical, you make it perfect. I keep it grounded, you give it wings. I love you. 18) I need to start the morning with it and end the day with it. It’s not coffee, but my husband’s kiss. I love you. 19) You have been my hottest crush, awesome date, sexiest boyfriend and passionate lover. All this put together makes you the most perfect husband ever. I love you. 20) Everything in my life revolves around a single thought – how I can keep you happy, because I love you a lot. 21) Some of the most precious moments of my life have been the ones in which I’ve held your hand and cuddled in your arms. I love you. 22) The perfect husband as described by magazines doesn’t exit. That’s because he has already been taken – by me. I love you. 23) All the men in this world should learn a thing or two, about being a perfect husband from you. I love you sweetie. 24) I love you not just because you are my husband but because I know that you always wish the best for me. Thanks. 25) I could tell you that you are a loving husband, wonderful father or a great husband. But you are much more than that – an example of a perfect man. I love you. 26) Your love is… sweet and exciting, heartwarming and tingling, passionate and sensational, protective and inspirational, warm and funny, cute and cozy, hot and luscious, charming and delicious. I love you. 27) Monday morning blues have become colorful, boring weekends have turned fun, Xbox has become interesting, cooking has become romantic and watching the TV has become a lot more cozier in the arms of a husband like you. I love you. 28) I love you so much that I would have married you even if you were a rock. 29) The additional responsibilities of marriage, being a good wife and a caring mother were never a burden on my shoulder because your strong shoulders were always there to support me. I love you darling. 30) I can stop indulging in chocolate, but never in you. I love you. 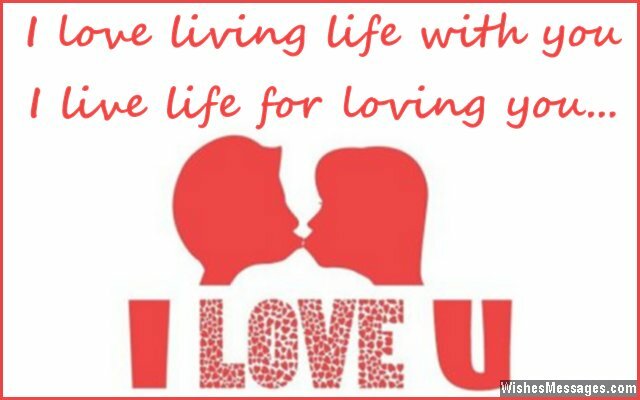 31) I love living life with you and I live life for loving you. I love you. 32) The woman who said that all men are the same, obviously never met a man as handsome and loving as you are. I love you. 33) You are like a wonderful kaleidoscope – every time I look into your eyes, I see a beautiful, radiant, magical, perfect and colorful future. I love you. 34) Becoming complacent has been the only downside of having a husband like you because there is nothing more I have ever wanted from life since the day I fell in love with you. 35) You are more handsome than a Greek god, more generous that a billionaire, more attractive than a Hollywood heartthrob, more caring than anyone else in the world – you are perfect. I love you. 36) Our love singes with passion and sensation. Our marriage hinges on care and affection. I love you. 37) It is good to have a husband who forgives you for your past. It is even better to have a husband who does not mind the mistakes you make in your present. But it is best to have a husband who forgets everything and wants to give you a bright future – just like the hubby that you are. I love you. 38) You are like a warm cuppa on a rainy afternoon, popcorn while watching a movie, rainbow during a thunderstorm, smile during stressful times, hammock on a beach and a sauna after a hectic week. You are the love, care and comfort of my life. I love you. 39) If I knew that all my wishes in life were going to be fulfilled on my wedding day, I wouldn’t have bothered putting so many socks on my bedside all throughout my childhood. Thanks, I love you. 40) The word wishlist doesn’t exist in my dictionary anymore, for life has already fulfilled mine by giving me an awesome husband like you. I love you.